Papercrafts, to make more of your card making talents. First let me say I am so sorry for the delay in sending this newsletter to you. It seems ages since I last wrote one. I have not been idle though, what with work and personal commitments I don't know where the time has gone. There just aren't enough hours in the day. I once thought that when I went semi-retired I would take things slower......not a chance! I am busier now, than when I worked full time....and loving every minute. I enjoy a good challenge and building this website has certainly been an experience. So thank you to everyone for signing up to my newsletter, and again I'm sory it's been a wait. I can't believe it's nearly August already, when Christmas was only a couple of months ago......wasn't it? Dare I say, it's nearly here again too. But the biggest part of the time has gone into adding new and exciting stuff to the website. I have worked hard to give you the most comprehensive, but clear instructions on how to acheive some of the ideas I have shown you. 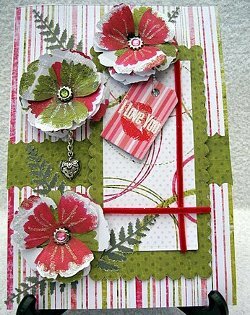 shaped cards with simple everyday objects, as well as some of the bought stuff on the market. And some different folds for you to try. Have a go at the Diamond top card, it looks hard, but once you have mastered the basics, it's really easy to do. I have made each of the designs, following my own measurements and instructions, to be sure they work, and hopefully you will try them too. are great,and the results are fab! I made this for my daughter, using papers from Funky Hand, but yours could say anything you want them to. Take a look at Anice's site and try some of her downloads, they are excellent value for money. There really is lots of new stuff for you to see, and I will continue to add more as I go along. 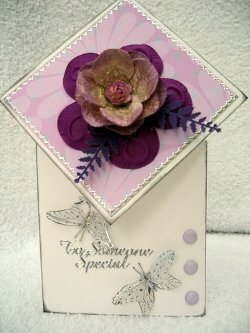 One of the things I was really excited about was using the papers, for some of my cards, by Summerime Designs. I asked Summer if she would mind me putting the link to her blog on my website. I was really honoured when she said Yes. So please feel free to click the link on my page for Free digital downloads and get some of her designs to your computer for F-R-E-E. They are really are fabulous. Well Happy Crafting in the warm weather....and if your in England, "what warm weather" I hear you saying! I hope you enjoy the new additions and thanks again for looking.